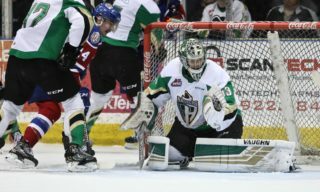 Prince Albert, SK – Parker Kelly, Brett Leason, and Ian Scott were selected to play for Team WHL at the 2018 CIBC Canada Russia Series on Wednesday morning. Kelly, Leason, and Scott will take on Team Russia for two games in Kamloops and Vancouver. The two-game set begins in Kamloops, BC on Monday, November 5 before shifting to Vancouver, BC on Tuesday night. 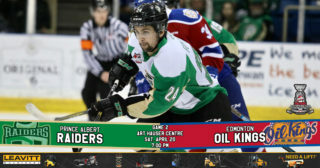 The trio of Raiders are the first to represent the club at the event since Brendan Guhle suited up for Team WHL at the 2016 CIBC Canada Russia Series. Leason, from Calgary, AB, is the WHL’s leading scorer entering play on Wednesday night. The 6’4, 199-lb winger has 11 goals and 15 assists in 12 games this season, which includes at least a point in every game. 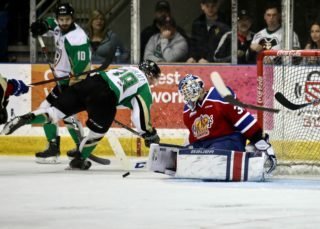 He’s also currently riding a five-game multi-point streak and was named the WHL On the Run Player of the Week on Monday. Kelly, an Ottawa Senators prospect from Camrose, AB, is averaging a point a game this season with six goals and five assists. The 6’0, 182-lb winger signed an entry-level deal with the Senators after earning an invitation to their training camp prior to the 2017-18 season. Scott, also from Calgary, was picked by the Toronto Maple Leafs in the fourth round of the 2017 NHL Entry Draft. The 6’3, 183-lb netminder has won nine of his 10 starts to begin the year, posting a 1.60 goals-against average and a 0.943 save percentage. His strong start has earned him WHL Eli Wilson Goaltending Goaltender of the Week award twice this year. Team WHL once again features an abundance of NHL prospects, including 10 players previously selected in the first two rounds of the NHL Draft or projected to be selected in the first two rounds of the 2019 NHL Draft. 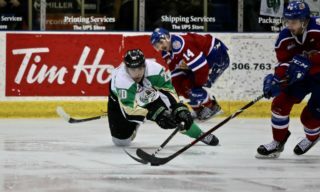 A trio of highly-touted defencemen from the 2018 NHL Draft will man the blueline for Team WHL, including Spokane Chiefs defenceman Ty Smith (New Jersey Devils, 1-17), Moose Jaw Warriors defenceman Jett Woo (Vancouver Canucks, 2-37), and Lethbridge Hurricanes defenceman Calen Addison (Pittsburgh Penguins, 2-53). Led by Portland Winterhawks captain Cody Glass (Vegas Golden Knights, 2017 ­– 1-6), Team WHL’s forwards will be powered by a strong group of highly-touted prospects set to hear their names called at the 2019 NHL Draft, including Dylan Cozens (Lethbridge Hurricanes), Kirby Dach (Saskatoon Blades), and Nolan Foote (Kelowna Rockets). 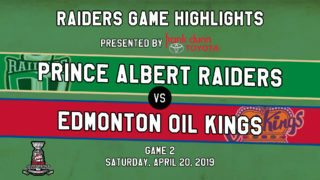 A pair of Vancouver Giants will have the opportunity to suit up for Team WHL in front of a hometown crowd when the series shifts to Vancouver for Game 2 on November 6. Sophomore defenceman Bowen Byram, projected to be selected in the first round of the 2019 NHL Draft, as well as Arizona Coyotes prospect David Tendeck, a product of North Vancouver, will both be in the lineup for Team WHL.